Do you often wake up and think wow; I'd like to go for a walk? But too many times this positive thought is overcome by the seething fear that the only place you have to walk is on flat, hard concrete, a boring and tedious journey around the block? 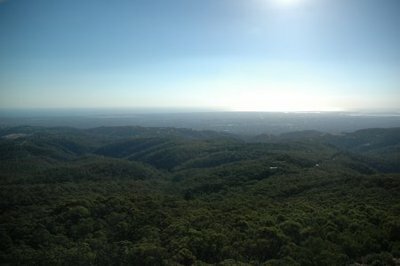 Well, you'll thank me later because I have the solution: walk Mount Lofty. Yes, I know what you are thinking. You would rather walk somewhere scenic and easy, like along the beach. Well, life wasn't meant to be easy and I promise you this walking trail is both scenic and ever so rewarding. The only obstacle is maybe the small drive to the bottom of the mountain (unless of course you want to walk there too, go for it). However you will find the drive along the winding Waterfall Gully road a pleasant and scenic surprise. The base of the walking trail begins at the Waterfall Gully car park, approximately 12km from the city centre and at the end of Waterfall Gully road. As this trail is very popular, if a weekend morning walk is your thing I suggest getting in early – car parks will fill up. The trail is a 7.8km round trip, and will take you past two waterfalls, some brilliant foliage and wildlife, an old China man's hut, a youth hostel and finally to the Mount Lofty Summit – a breathtaking view of Adelaide. The trail is not a leisurely stroll. It is an uphill climb to say the least and it is definitely a workout, but a bit of exercise never hurt anyone. The connection with nature and the things you see along the way make it thoroughly enjoyable, not to mention the 'top of the world' feeling, that pure accomplishment when you get to the summit. And if all the exercise was a bit much, there is a conveniently placed cafe at the summit – get a coffee and cake as a reward. honestly, it's an experience at the least. Take a water bottle, you will probably need it. And once you get to the top, remember its all downhill from there.